The work 'The Other Side of Time' speaks of intersections in personal and political history- specifically the artists ongoing interest and engagement in the Partition of India. 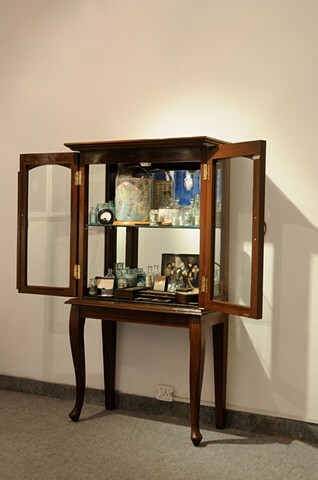 In this 'cabinet of curiosities' filled with antiquarian maps, prints, collaged texts from antiquarian books, vintage medicinal and laboratory glass, the the artist recalls journey her grandparents made when they when they left their homes and belongings in Pakistan to start a new life as refugees in independent India. The cabinet stands as a receptacle and a momento mori of those who made this tumultuous crossing they had made, their experiences and the belongings left behind. My maternal grandparents lived in a rambling home in New Delhi, which they built after the Partition. Many a afternoon was spent in that home during my vacations with my cousins exploring and hearing vignettes of my grandparents lives. In 1947, my grandparents, like millions of Indians arrived in Delhi as refugees having left their homes and all of their material belongings in Lahore (which was then a part of pre-Partitioned British India) to start life anew in independent and secular India following the splitting of British India into the independent nations- Pakistan and India. In that home, in one of the many rooms radiating from a central courtyard stood a glass-fronted almirah which filled with a collection of objects and curiosities that stood testament to the journeys they had made. I have used sections of original antiquarian maps and engravings of British India, collaged text and imagery from antiquarian books on contemporary printed material, vintage medicinal and laboratory glass containers to re-create this cabinet of curiosities. The work also serves as a momento mori of our tumultuous personal history. The title "Twilight of the Gods" is the name of an opera written in 1876 by German composer Richard Wagner and is a translation of a prophesied mythological war of the gods which causes the end of the world.